The 2018 National League Championship Series was a best-of-seven playoff pitting the Milwaukee Brewers against the Los Angeles Dodgers, for the National League (NL) pennant and the right to play in the 2018 World Series against the AL Champions, the Boston Red Sox. The series was the 49th in league history, with Fox airing all games in the United States. This series was the first time two teams that won their division in a tiebreaker game faced each other in a playoff series, as well as the first postseason match-up between the Brewers and Dodgers. For the first time since 2012, the NLCS reached a game seven, with the Dodgers defeating the Brewers and winning back-to-back pennants for the first time since 1977-1978. For the second year, Major League Baseball sold presenting sponsorships to all of its postseason series; as with the ALCS, this NLCS was sponsored by Google Assistant and was officially known as the National League Championship Series presented by Google Assistant. The Brewers won the National League Central division for the first time since 2011 in a tie-breaker game over the Chicago Cubs at Wrigley Field, and then swept the Colorado Rockies in the National League Division Series. Dating back to the regular season, the Brewers had won 11 straight going into the NLCS. By virtue of their regular season record, highest in the league, the Brewers hold home-field advantage throughout the National League playoffs. This is the Brewers’ third League Championship Series and second in the National League, their prior NL appearance being a 2011 NLCS loss to the St. Louis Cardinals in six games. Milwaukee also appeared in and won the 1982 ALCS, occurring during their 29 year stay in the American League. Like the Brewers, the Dodgers won the National League West in a tie-breaker game, defeating the Colorado Rockies at Dodger Stadium for their sixth straight division title. The Dodgers then beat the Atlanta Braves in four games in the NLDS. This is the Dodgers’ third straight appearance in the NLCS, and their fourth appearance in the past six seasons. Overall, this is their 13th NLCS trip, tying the Cardinals for most appearances by a team. This is the first ever playoff matchup between the Brewers and Dodgers. The two cities did meet with the pennant on the line in 1959 when the Dodgers beat the Milwaukee Braves (now the Atlanta Braves) in a best-of-three playoff. However, MLB counts the tie-breaker series as regular season games. This is also the first ever League Championship Series between two teams that won tiebreakers, and only the third postseason meeting of any sort between two MLB teams involved in tiebreakers. The first ever such meeting was the 2018 National League Wild Card Game in which the Rockies defeated the Cubs and the second was the NLDS in which the Brewers defeated the Rockies. The Dodgers became the first tiebreaker team since the 2007 Colorado Rockies to reach the World Series. Los Angeles was 4–3 in their seven games against Milwaukee during this year's regular season. For the 2018 regular season. Los Angeles won the series, 4–3. Brewers announcer and former MLB player Bob Uecker threw the ceremonial first pitch. Clayton Kershaw started game one for the Dodgers, while Gio González started for the Brewers. The Dodgers scored first, on a homer by Manny Machado in the second inning, which was the only run and hit allowed by González who was replaced after only two innings. His replacement, relief pitcher Brandon Woodruff, homered off Kershaw to tie the game in the third inning. A sacrifice fly by Hernán Pérez scored Lorenzo Cain to put the Brewers up 2–1 after three. A two-run pinch-hit single by Domingo Santana in the fourth inning extended the lead to three and a single by Ryan Braun scored Santana to make it 5–1. Kershaw allowed five runs on six hits and two walks in a little over three innings, the shortest post-season outing of his career. Yasmani Grandal of the Dodgers became the first catcher in post-season history to have two errors and two passed balls in the same game. The Brewers added on to their lead when Jesús Aguilar hit a homer off of Julio Urías in the seventh inning. The Dodgers loaded the bases in the eighth inning against Joakim Soria and managed to score three runs on back-to-back RBI singles by Machado and Matt Kemp off of Jeremy Jeffress to narrow the gap to 6–4. Chris Taylor hit an RBI triple in the ninth off Corey Knebel, who managed to retire Justin Turner to save the 6–5 win for the Brewers. Brandon Woodruff became only the third relief pitcher in major league history to homer in a postseason game, matching the feat of Rosy Ryan (in Game 3 of the 1924 World Series) and Travis Wood (in Game 2 of the 2016 NLDS). Justin Turner's two-run homer gave Los Angeles the lead, and ultimately the win, in Game 2. Former Brewers All-Star player Prince Fielder threw the ceremonial first pitch. Hyun-jin Ryu started the second game for the Dodgers and Wade Miley for the Brewers. The game remained scoreless into the fifth inning, when Orlando Arcia hit a homer to put the Brewers on the board. They scored a second run on an RBI groundout by Ryan Braun. Ryu was lifted after 4​1⁄3 innings, he allowed two runs on six hits with four strikeouts. Miley pitched 5​2⁄3 shutout innings with no walks and only two hits allowed. Travis Shaw homered off Alex Wood in the sixth inning to extend the lead to three. An RBI single by Cody Bellinger in the seventh inning off Corbin Burnes gave the Dodgers their first run of the game. A bases loaded walk by Jeremy Jeffress scored another run for the Dodgers. The Dodgers took the lead in the top of the eighth when Justin Turner hit a two-run home run off of Jeffress. This was Turner's second career go-ahead home run in the seventh inning or later in the postseason, joining Kirk Gibson as the only other Dodger to accomplish this feat multiple times. The Dodgers bullpen kept the Brewers from scoring and they won the game 4–3 to even up the series at one all. Kenley Jansen earned his second save of the postseason. This was the Brewers first loss since September 22. Brewers' starter Jhoulys Chacín, seen here with the Angels in 2016, was the Game 3 winning pitcher. Former Dodgers All-Star player Andre Ethier threw the ceremonial first pitch. The Dodgers' starting pitcher was Walker Buehler, while the Brewers started Jhoulys Chacín. The Brewers scored in the top of the first inning, when Christian Yelich walked and Ryan Braun drove him in with a double. The Brewers added a second run in the sixth inning when Travis Shaw tripled and then scored on a wild pitch by Buehler. Chacín pitched 5​1⁄3 innings, and allowed only three hits and two walks while striking out six batters. Orlando Arcia hit a two-run homer in the seventh to put the Brewers up 4–0. Buehler pitched seven innings, allowing four runs on five hits with eight strikeouts. The Dodgers loaded the bases in the ninth against Jeremy Jeffress, but Brian Dozier struck out looking to end the game. The Brewers finished off a five-hit shutout of the Dodgers to take a two games to one lead. It was the first time the Dodgers had been shutout in a post-season game at home since Game 1 of the 1983 NLCS. For Game 4, former Dodger All-Star Shawn Green threw the ceremonial first pitch. The Brewers started Gio González on short rest, after his Game 1 start. The Dodgers countered with Rich Hill, making his first appearance of the series. The Dodgers took an early lead on a RBI single by Brian Dozier in the bottom of the first inning. González left the game in the second inning after injuring his ankle fielding a grounder from the first batter of the inning. He allowed one run on two hits and one walk. Domingo Santana tied the game up, driving Orlando Arcia in with a pinch-hit double in the fifth inning. Hill pitched five innings, with the one run allowed on three hits and three walks with six strikeouts. There was no further scoring through the end of regulation. In the 10th inning, benches briefly emptied after Manny Machado had contact with Milwaukee first baseman Jesús Aguilar on a ground out. In the bottom of the 13th, Machado singled with one out, and advanced to second on a wild pitch with two outs. Cody Bellinger hit a walk-off single to score Machado. Junior Guerra picked up the loss in his fourth inning of relief for Milwaukee, while Julio Urías, who had pitched the top of the 13th for Los Angeles, got the win. The game lasted five hours and fifteen minutes, making it the second longest NLCS game; Game 5 of the 1999 NLCS had lasted five hours and forty-six minutes. In Game 5, Clayton Kershaw allowed just one run in seven innings pitched, getting the win as the Dodgers went ahead in the series, 3–2. With the Dodgers in danger of going down 3-2, this game featured the second starts of the series for Clayton Kershaw and for the Brewers Wade Miley, the latter of whom was pitching on short rest. Miley (who throws left-handed) walked the first batter he faced and was immediately removed by Brewers manager Craig Counsell in favor of Brandon Woodruff (who throws right-handed). The Brewers got on the board first in the third inning with an RBI double by Lorenzo Cain. Austin Barnes drove in Chris Taylor with a single in the fifth inning to tie the score. A single by Max Muncy drove in the go-ahead run (Justin Turner) in the sixth inning. A pinch-hit single by Yasiel Puig added another run to put the Dodgers up by two after six innings. Woodruff wound up pitching 5​1⁄3 innings, and allowed the three runs on five hits, one walk and two hit batters while striking out eight. In the seventh inning, the Dodgers added two more runs. Turner drove in a run with a single off Joakim Soria and another run scored on a ground out by pinch hitter Brian Dozier. 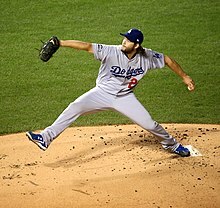 Kershaw pitched seven innings, allowing one run on three hits and two walks while striking out nine. He also walked twice as a batter, becoming just the third pitcher in the last 20 years to do so in a post-season game (Jon Lester in the 2016 NLCS and Derek Lowe in the 2008 NLDS). Pinch hitter Curtis Granderson doubled in a run off Ryan Madson in the ninth inning to cut the score to 5–2. Kenley Jansen came in and struck out Mike Moustakas to end the game. Milwaukee reliever Corey Knebel pitched ​1 2⁄3 innings without allowing a hit and got the Game 6 win. The sixth game in the series featured a rematch between Game 2 starters Hyun-jin Ryu and Wade Miley. Following his abbreviated start in Game 5, when he faced a single batter, Miley became the first pitcher in 88 years to start back-to-back games in the postseason. The last pitcher to do so was George Earnshaw of the Philadelphia Athletics in the 1930 World Series. Miley also was just the sixth pitcher to start three games in a league championship series. Commissioner Emeritus of Baseball and former Brewers owner Bud Selig threw the ceremonial first pitch. David Freese, batting leadoff for the first time in the series, opened the game with a home run off of Miley to give the Dodgers the lead. Back-to-back RBI doubles by Jesús Aguilar and Mike Moustakas and a RBI single by Erik Kratz scored four runs for the Brewers in the bottom of the inning. A double by Ryan Braun added another run in the second. Ryu was removed after three innings. He allowed five runs on seven hits and two walks with only three strikeouts. Freese drove in a second run for the Dodgers in the fifth inning with a double. Miley allowed two runs on five hits and two walks with four strikeouts in 4​1⁄3 innings. A wild pitch by Kenta Maeda in the seventh inning scored another run and a single by Aguilar off Rich Hill in the eighth put the Brewers up 7–2, which wound up being the final score, setting up a game seven. Yasiel Puig's three-run homer in the sixth inning were the final runs in a 5–1 Dodgers victory. For the first time since 2012, when the Giants defeated the Cardinals, and the tenth time in NLCS history, the NLCS went to a game 7. With this NLCS the Dodgers tied for the fourth most game sevens in history with the Pittsburgh Pirates and the Boston Red Sox. The starting pitchers—Walker Buehler for Los Angeles and Jhoulys Chacín for Milwaukee—were the same as Game 3, won by the Brewers. Hall of Fame inductee and former Brewer Robin Yount threw the ceremonial first pitch. Christian Yelich homered off Buehler in the first inning to give the Brewers the early lead and then Cody Bellinger hit a two-run homer in the second to put the Dodgers on top. Chacín only pitched the first two innings, allowing two runs on three hits and one walk. Buehler pitched 4​2⁄3 innings, allowing one run on six hits with seven strikeouts. Chris Taylor made a run saving catch in the bottom of the fifth off the bat of Yelich and then Yasiel Puig hit a three run home run off Jeremy Jeffress in the sixth to extend the lead. The Dodgers would go on to win 5–1 as Clayton Kershaw retired Shaw, Aguilar and Moustakas to claim their second straight National League title, forty years after they accomplished the feat in 1977 and 1978. The Dodgers were the first team to clinch a pennant on the road in a game seven since the 2006 Cardinals. This was also Los Angeles first playoff series win where they did not win Game 1 since the 1988 NLCS. Cody Bellinger was named the NLCS MVP, becoming the youngest to win the award. ^ Playoff bracket set as Brewers, Dodgers win. MLB.com. Retrieved on October 1, 2018. ^ "Boxscore: Dodgers vs. Brewers, Game 1". MLB.com. Retrieved October 12, 2018. ^ "Boxscore: Dodgers vs. Brewers, Game 2". MLB.com. Retrieved October 13, 2018. ^ "Boxscore: Brewers vs. Dodgers, Game 3". MLB.com. Retrieved October 15, 2018. ^ "Boxscore: Brewers vs. Dodgers, Game 4". MLB.com. Retrieved October 16, 2018. ^ "Boxscore: Brewers vs. Dodgers, Game 5". MLB.com. Retrieved October 17, 2018. ^ "Boxscore: Dodgers vs. Brewers, Game 6". MLB.com. Retrieved October 19, 2018. ^ "Boxscore: Dodgers vs. Brewers, Game 7". MLB.com. Retrieved October 20, 2018. ^ McCalvy, Adam (October 13, 2018). "Uecker gets honor of first pitch of NLCS". MLB.com. Retrieved October 16, 2018. ^ Kelly, Matt; Randhawa, Manny (October 12, 2018). "Every pitcher who went deep in postseason". MLB.com. Retrieved October 13, 2018. ^ Kleinschmidt, Jessica (October 13, 2018). "Prince Fielder tossed the first pitch prior to NLCS Game 2 and had some fun with Ryan Braun in the process". MLB.com. Retrieved October 16, 2018. ^ "2018 Milwaukee Brewers Schedule". Baseball-Reference.com. October 2018. ^ @TCiniglio (October 15, 2018). "Andre Ethier throwing out the first pitch to Matt Kemp tonight" (Tweet). Retrieved October 16, 2018 – via Twitter. ^ @ajhaney32 (October 16, 2018). "Mood instantly changed" (Tweet). Retrieved October 16, 2018 – via Twitter. ^ Trezza, Joe (October 16, 2018). "Gio exits in 2nd with apparent ankle injury". MLB.com. Retrieved October 16, 2018. ^ Zolecki, Todd (October 17, 2018). "Machado called out as 'dirty' after eventful G4". MLB.com. Retrieved October 17, 2018. ^ Grabar, Henry (October 17, 2018). "I Think Maybe This Is the Fastest Pitching Change I've Ever Seen in a Baseball Game". Slate. Retrieved October 17, 2018. ^ Townsend, Mark (October 17, 2018). "Brewers' Wade Miley is first pitcher in 88 years to face this postseason challenge". yahoo.com. Retrieved October 19, 2018. ^ @DanMullen_ESPN (October 19, 2018). "Former commissioner Bud Selig" (Tweet). Retrieved October 19, 2018 – via Twitter. ^ McCalvy, Adam; Gurnick, Ken (October 20, 2018). "Dodgers-Brewers G7: Lineups, matchups, FAQs". MLB.com. Retrieved October 20, 2018. ^ @Steph__Sutton (October 20, 2018). "Hall of Famer Robin Yount throwing out the ceremonial first pitch before Game 7" (Tweet) – via Twitter. "Gerry Davis, Joe West crew chiefs for league championships". Boston.com. AP. October 11, 2018. Retrieved October 12, 2018. McCullough, Andy (October 19, 2018). "Brewers chase out Hyun-Jin Ryu early to force a NLCS Game 7 against the Dodgers". Los Angeles Times. Retrieved October 20, 2018. Rosiak, Todd (October 19, 2018). "Brewers 7, Dodgers 2: The offense wakes up to take the NLCS to Game 7". Milwaukee Journal Sentinel. Retrieved October 20, 2018.